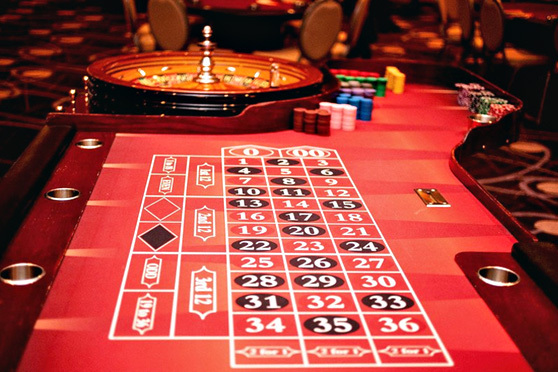 The table is made of beautiful oak wood and can really make your party come alive.ur ROULETTE casino tables rentals are a high level professional casino grade. Each table is made out of oak wood and has a carved inset wooden chip tray for each individual player along with a drink rail and a thick padded arm rest for comfort. To determine the winning number and color, a croupier spins a wheel in one direction, then spins a ball in the opposite direction around a tilted circular track running around the circumference of the wheel. The ball eventually loses momentum and falls onto the wheel and into one of 38 colored and numbered pockets on the wheel. Roulette players have a variety of betting options. Placing inside bets is either selecting the exact number of the pocket the ball will land in, or a small range of pockets based on their proximity on the layout. Players wishing to bet on the ‘outside’ will select bets on larger positional groupings of pockets, the pocket color, or whether the winning number is odd or even. The payout odds for each type of bet are based on its probability. The roulette table usually imposes minimum and maximum bets, and these rules usually apply separately for all of a player’s inside and outside bets for each spin. For inside bets at roulette tables, some casinos may use separate roulette table chips of various colors to distinguish players at the table. Players can continue to place bets as the ball spins around the wheel until the dealer announces no more bets or rien ne va plus.